Welcome to Sam Cobb Farms We Grow Good Dates! 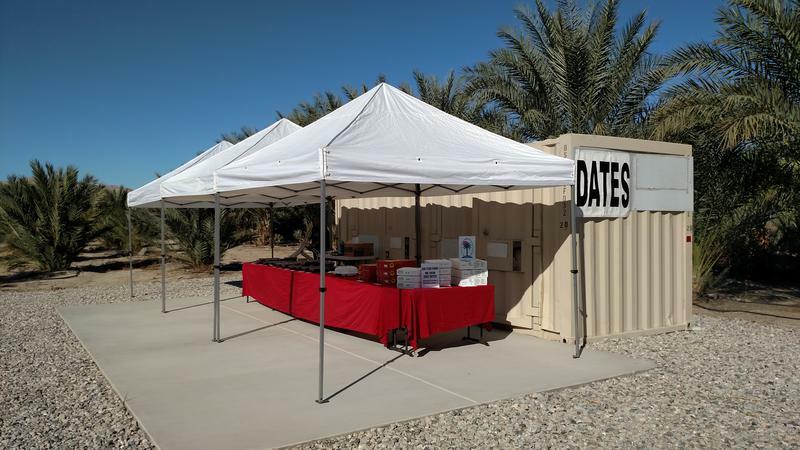 COME TO SAM COBB FARMS for Medjool Dates! Sample before you buy. Take the photo tour. Learn about dates. Meet Sam! OPEN to the public on WEEKENDS (Sat & Sun) 9 am to 5 pm from October to April ...and other times by arrangement! enjoyed! 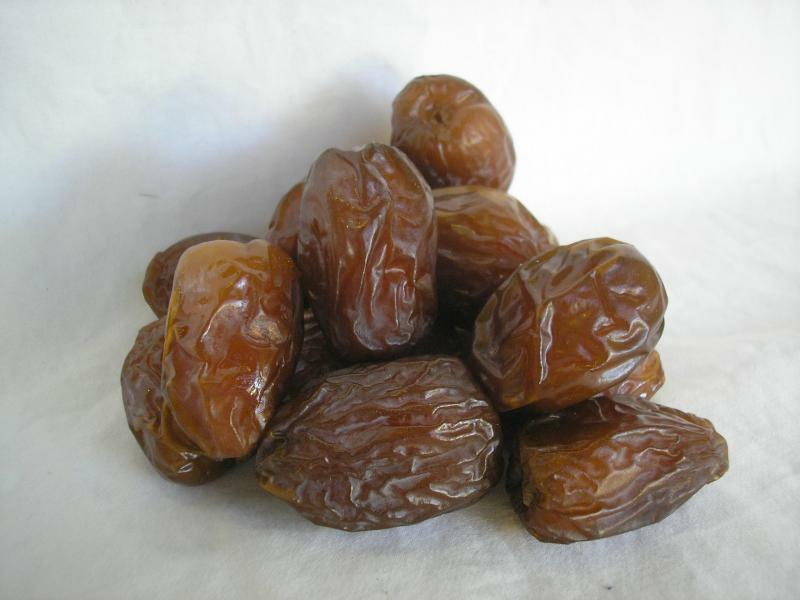 We grow seven delicious date varieties in all, including Medjool, Barhi, and our very own...Black Gold. Sam Cobb Farms...We Grow Good Dates! WELCOME to Sam Cobb Farms From our family to yours, thanks for stopping by! 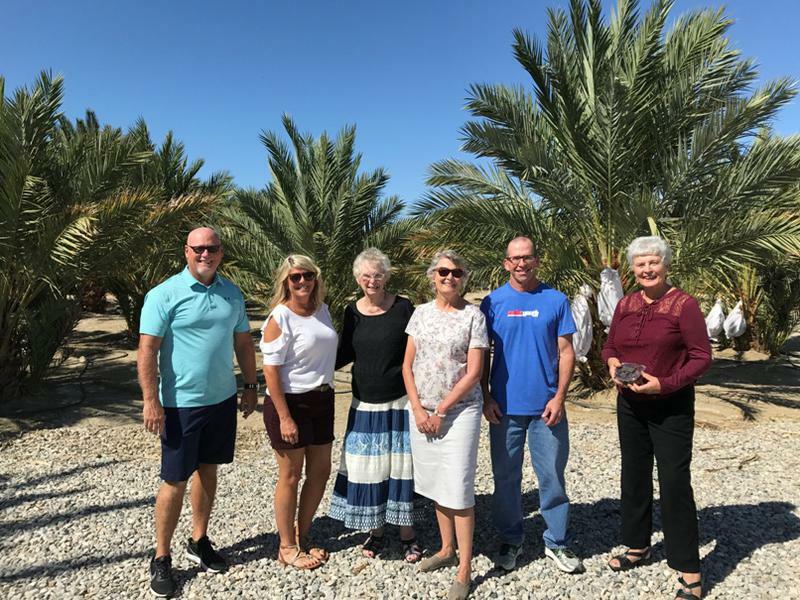 After following the marked signs along Dillon Road to Sam Cobb Farms in Sky Valley, I not only discovered the freshest and most delicious dates, but I became fascinated with Sam Cobb’s passion for and knowledge of date farming. “I was three years old when I saw my first tractor from my parent’s porch in Fresno, CA. From that moment on, I wanted to be a farmer. My favorite TV show has always been “Green Acres,” recounts Sam. He started by obtaining two Agricultural degrees at Fresno State University in the 1980s. During this time, he met and fell in love with Maxine. He only had one prerequisite for marriage. “Would she be willing to be a farmer’s wife?” Her answer was yes, and they began farming vegetables in Fresno. Times were tough for farmers then, so when he was offered a job in 1996 with the U.S. Dept. 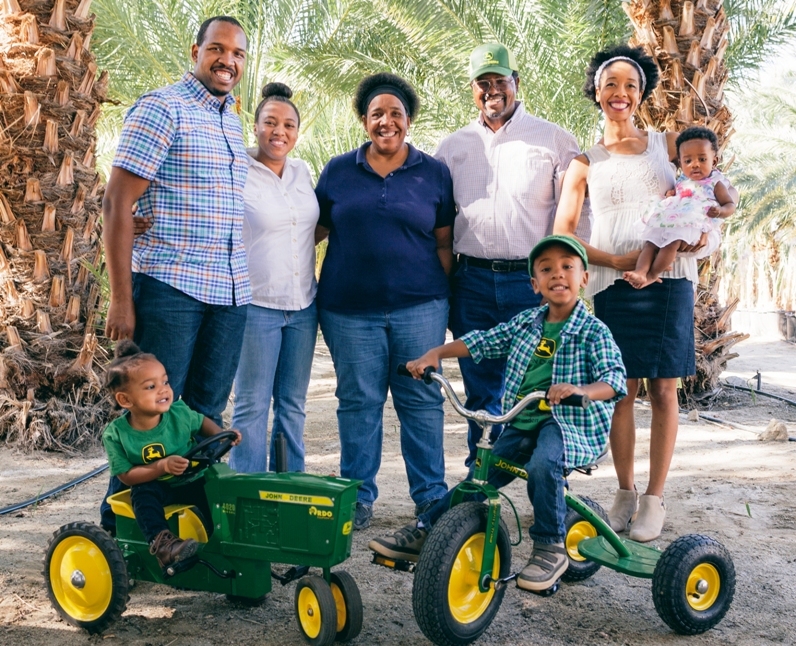 of Agriculture based in Indio, he took it and moved his family to La Quinta. 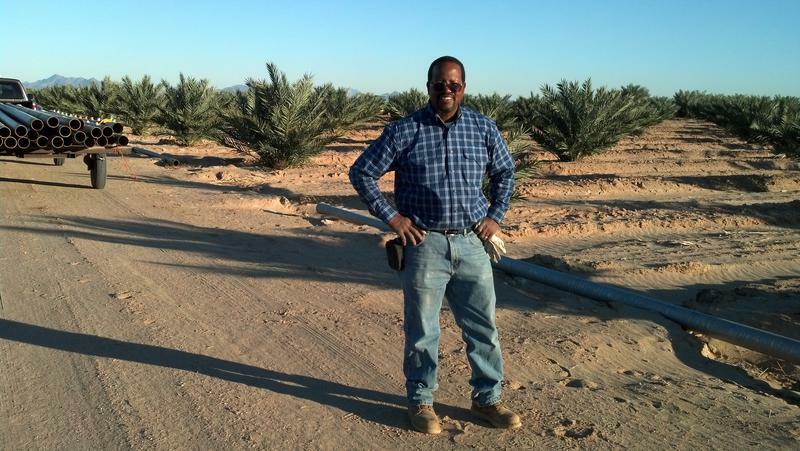 Through his job in Soil Conservation, Cobb visited many date farms and started doing research on the process of cultivating dates. Ten years ago, the opportunity came to buy five acres of land in Sky Valley. 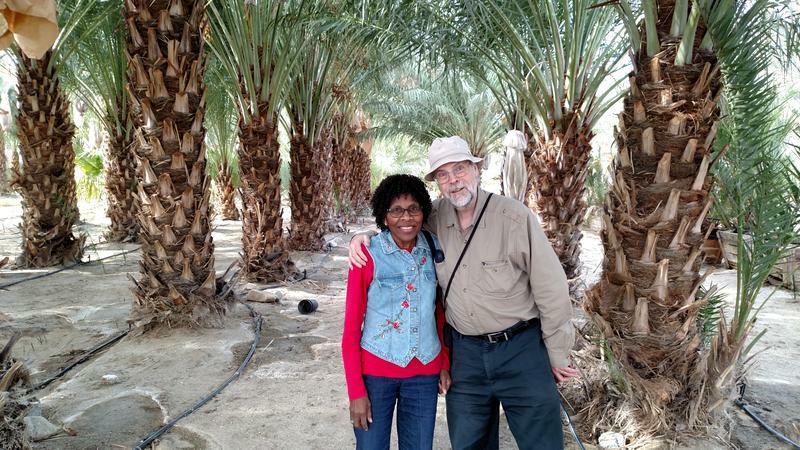 Sam and Maxine decided to invest in their own date farm by planting date trees. They realized the process would take years, and that they would both still need to continue in their day jobs. Maxine is a fifth grade teacher at LB Johnson Elementary School in Indio. Sam’s education, research, years of experience, business skills, and careful long term planning made his dream possible. Ten years later, the Cobbs are realizing their first truly exceptional crop of dates. As Sam walked me through the 300 trees, consisting of seven different varieties, he spoke passionately about his dates. Here’s what I learned: Date trees grow from suckers and seeds. There are female trees which must be pollinated by the male trees. Sam’s farm has a ratio of 30 females to 1 male. 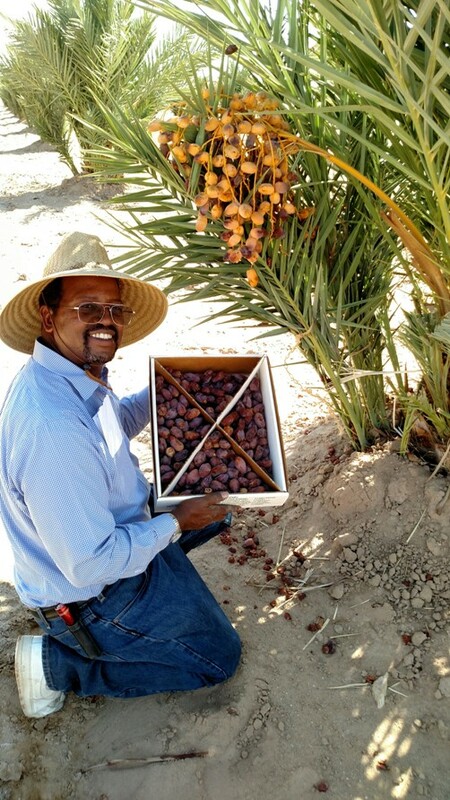 If a sucker is planted then he knows for sure what variety of dates will be produced. It’s like cloning. If grown from a seed, no one is sure who’s the daddy and therefore one can’t be sure what variety will be produced. The dates must be covered with bags while maturing to keep away the birds. Date trees take 10 years to mature but live for 150 years. A healthy tree never stops producing. 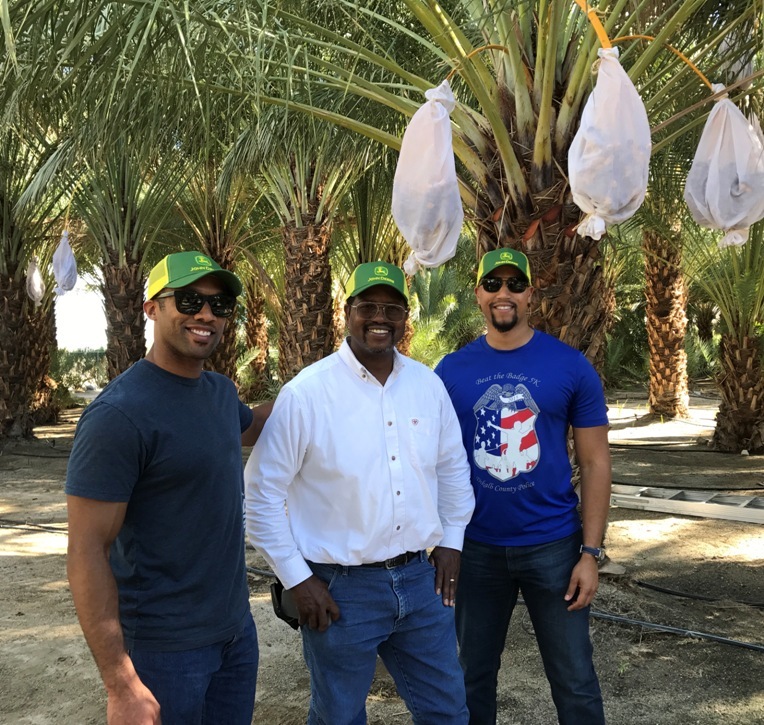 It’s a generational crop, and Cobb hopes his kids and their kids will continue the tradition of date farming. The farm starts harvesting the popular Medjool in September, and the rest, including the Barhi and Zahidi, are all picked by January. 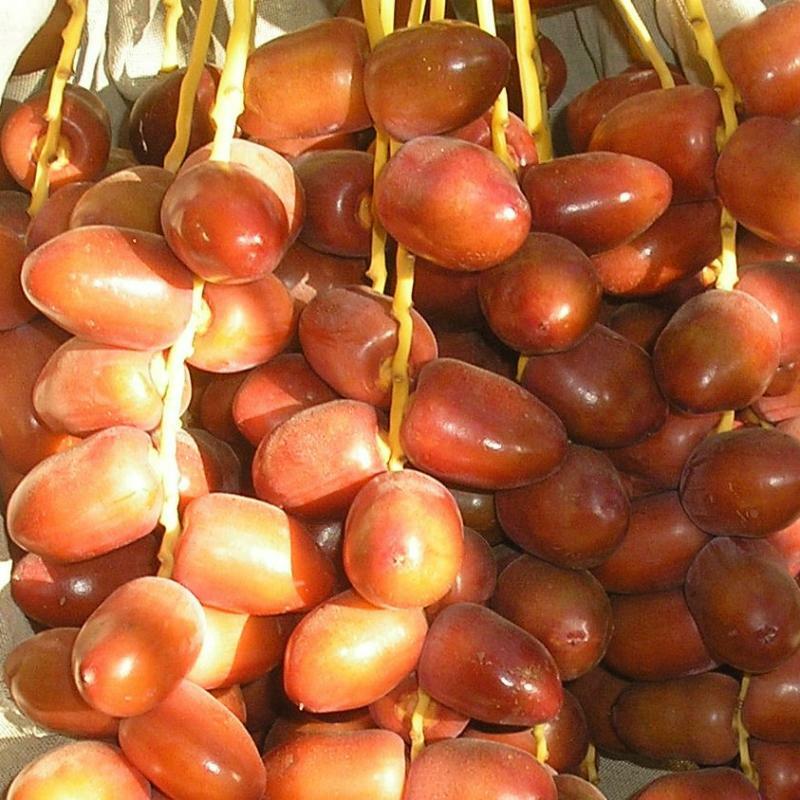 Dates can last for a long time depending on the care. All Cobb’s dates are fresh and grown pesticide free . 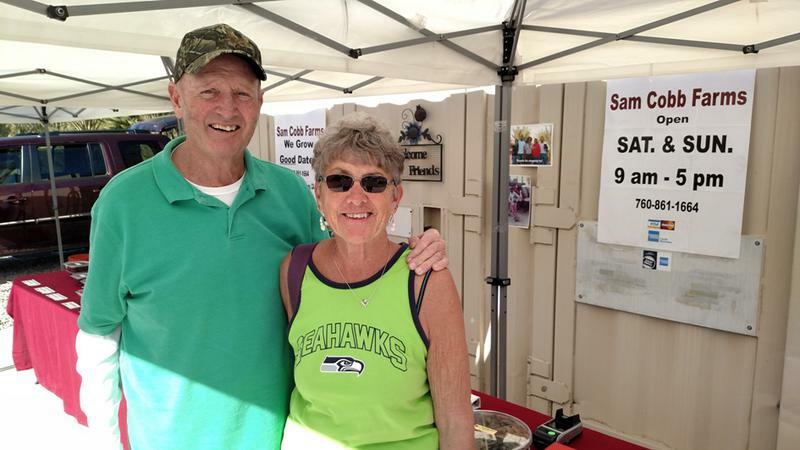 Maxine and Sam are at their stand on weekends from 9 a.m. to 5 p.m., October through April. They will mail dates, too. For more information go to samcobbfarms.com or call (760) 861-1664. The farm is located at 22-325 Henry Rd., Sky Valley, 92241. If using a GPS, put in Desert Hot Springs as the city. Make the trip and be in for a treat. COME TO OUR DATE FARM AND PUT YOURSELF IN THE PICTURE! 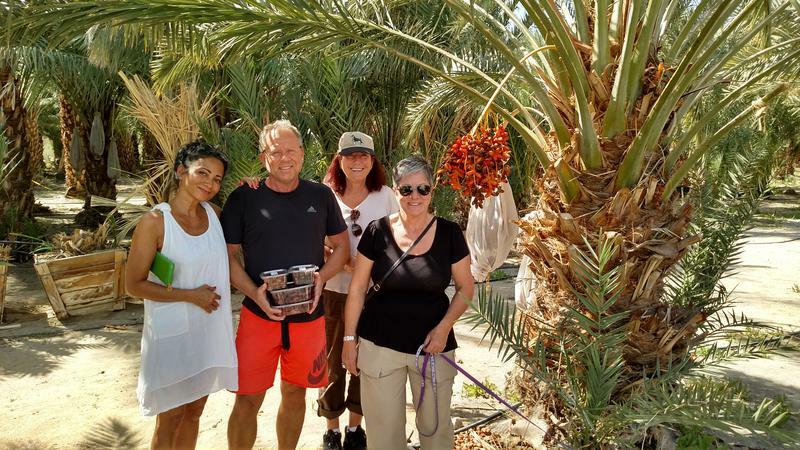 photograph yourself with the beautiful date palms and create a lasting memory! meet the real Sam Cobb! 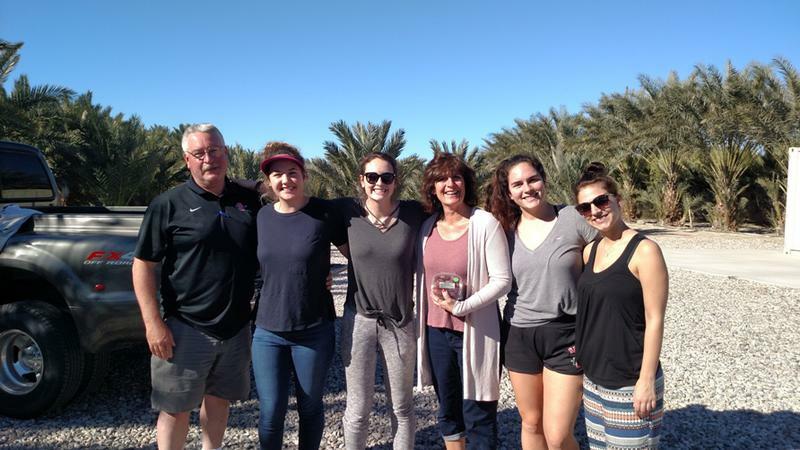 The Fortin Family, farm guest from Susanville, CA ...our date farm is a great place for families to gather and create a memory! 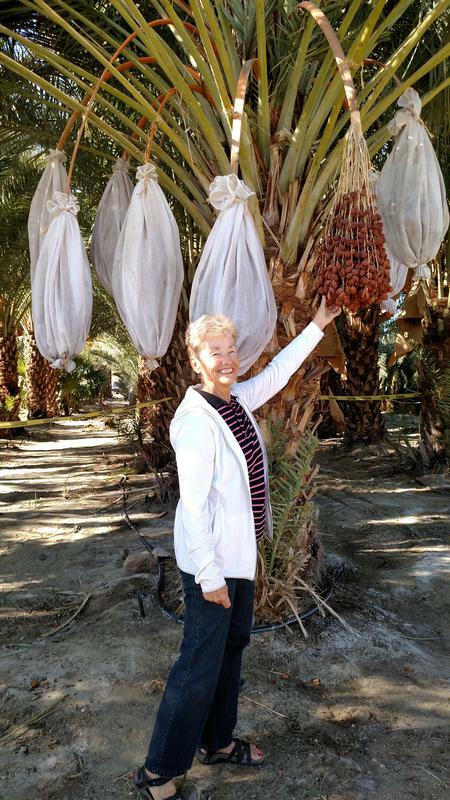 First Fruits from young Medjool date palms. On-Farm Sales: Saturdays and Sundays! 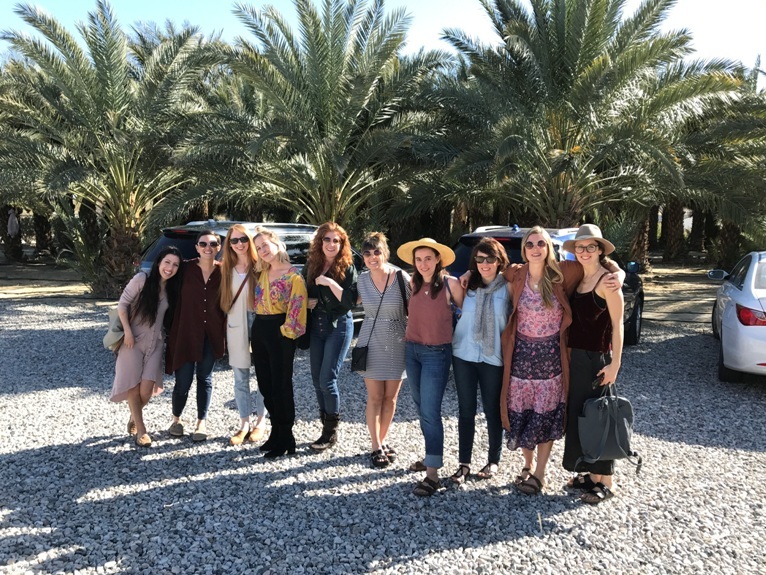 We are Palm Springs and Coachella Valley's #1 Source for Great local date farm dates! Sam has always wanted to be a farmer. Yes, always! - none stop and uninterrupted throughout life. Even, all the way back from the age of 3 or 4 years. Sam says he was "born to farm". Sam loves talking with people about farm life and agriculture in general, regardless of the crop or the farm type. For Sam, farming is farming, and he loves farming for what it is...a way of life! We love it when people enjoy life on the farm! Farm guest from Oklahoma City, OK...thanks for stopping by!